The Dutch boatyard Moonen recently launched its 96' "Clementine", the first model in a new range of motor-yachts that can be fully customised. This new generation will be made up of displacement cruisers of a length between 84 and 120' and will adopt certain unusual aspects typically found in this Dutch builder's products, such as retro design coupled with innovative solutions and modern technology. For "Clementine" René van der Velden designed classic lines, smoothed with soft, flowing curves that pleasantly contrast with the modern interiors, specially planned by Alessandra Negrato and ennobled with original paintings commissioned by the owner from a personal friend. These allow for vast living areas, obtained thanks to the hull's large freeboard, that meant the whole living area could be laid out above the water line. Along the lower deck are the guest cabins and crew quarters. The former have six berths and three bathrooms while the latter have four berths and two bathrooms. In addition to this and still on this deck, is a single cabin with bathroom which in this particular case is used by the nanny of the owner's children. 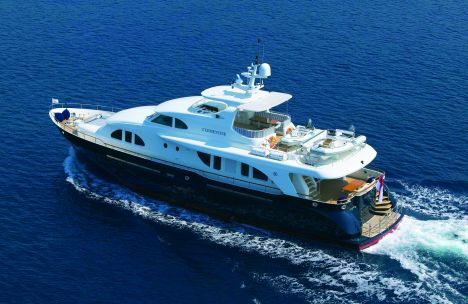 The owner has a large suite in the bow area of the main deck, furnished with two beds, wardrobe and bathroom. Heading towards stern is a large kitchen, daytime bathroom, dining area for eight and lounge. Externally, the main deck has a relaxation area at stern, perfect for al fresco cocktails or for chatting. The upper deck houses the bridge from where you can reach a resting area by going up a few steps. This area is protected by a T-Top and can be further closed off by a transparent mobile structure. Two resting points are planned for the tenders on the stern extension of this deck that can be moved using a special mini crane. "Clementine" like the other Moonen yachts, was built in compliance with Lloyd's Register and the MCA regulations. For further information: Moonen Shipyards; Postbus 3186; 5203 DD's-Hertogenbosch; Holland; tel. +31 (0)73 6210094; fax +31 (0)73 6219460; web site www.moonen.com; e mail info@moonen.com.